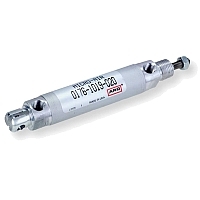 Micro-Air™ Series 01 Cylinders by ARO® Division of Ingersoll Rand are ideal for small part positioning, clamping and ejection. Also they're the perfect choice for applications where small bore, medium duty, repairable cylinders are preferred. Prelubed, they're suitable for operations without externally applied lubrication. Bore size from ½" thru 1⅛"